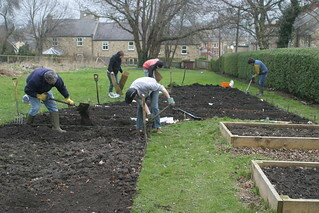 The Hexham Middle School Community Garden was founded in 2011 when Transition Tynedale was offered the use of a piece of land adjacent to Hexham Middle School. The plan was to create a community garden to be used by school children, local groups and individuals. We also run courses and workshops from the garden to teach basic growing skills and to allow people hands on experience of gardening. Since then, the garden has grown and developed into a beautiful haven of native species hedges, fruit trees, as well as basic crops. We have made quirky features such as turf sofas and a willow den, as well as the necessities of compost heaps, water butts and storage. We are a friendly bunch, and always happy to see new faces. So if you’d like to seek refuge from your too-busy schedule, drop by on the 1st and 3rd Saturdays of the month, 10:30am – 2:00pm. Hard work will be rewarded with tea and biscuits, and good company.